A motorist sent us this photo taken of a SafeZones van which appears to show the operator talking on a cell phone without a hands free device while driving. The motorist stated that he spotted the van on the inner loop of I-695 near Reistertown Road at 6:25pm Friday Aug 26, 2011. Last year the General Assembly passed Senate Bill 321/HB538 banning the use of cell phones while driving unless a hands-free device is used. In Maryland this is now 'secondary offense' which carries a $40 fine for the first offense and up to $100 for subsequent offenses. The law exempts "law enforcement personnel", however the SHA's safezones vans are driven by employees of their private contractor, ACS, rather than by police. Police officers receive special driver training at a level which most motorists (including private contract drivers) generally do not. The Maryland Department Of Transportation (of which the State Highway Administration which administers the SafeZones programs is a part) claims that cell phone use is responsible for 28% of all traffic crashes and causes 1.6million traffic accidents every year nationwide. Earlier this year a SafeZones van driven by an ACS contractor was caught on video speeding at 80mph. The video was broadcast on a local Baltimore news station. 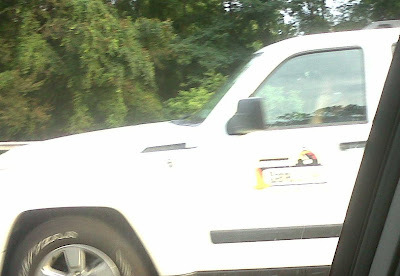 Readers who observe dangerous driving behavior by camera vans should feel free to report it to StopBigBrotherMD@gmail.com. Please remember do not drive distracted.